SUMMARY: Higher education alumni organizations rely too much on alumni altruism, and fail to give alumni many benefits with real value. A new ebook reveals the data, and offers new solutions to help leaders boost alumni engagement. About a 5 minute read. Institutions of higher education have a long history of appealing to their alumni's sense of altruism and philanthropy to generate donations. But a new study compares alumni organizations with all types of constituent-based organizations, and the results show that too many appeals to alumni altruism can backfire, leading to less engagement and giving. 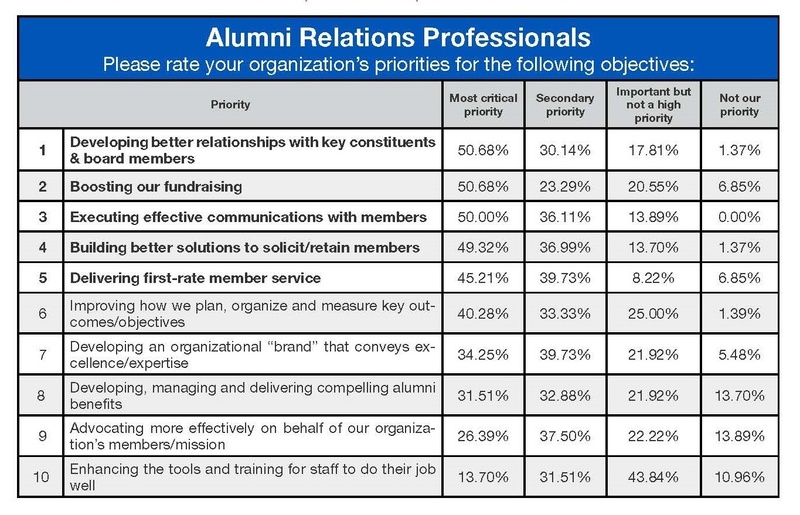 The new study compares alumni/advancement professionals with leaders from nearly all other types of member-based organizations, like trade associations, unions, and non-profit groups. What do these organizations have in common with alumni organizations? For all professionals responsible for driving member engagement, the priorities and goals are much the same. First you attract the attention of members and get them to engage with the organization. Engagement can mean different things to different groups, but for most it involves getting a constituent to invest their time, talent or treasure with the organization. Once they become engaged, you work hard to retain these engaged members over time. Attract. Engage. Retain. Three pretty straightforward concepts in this industry. Right? 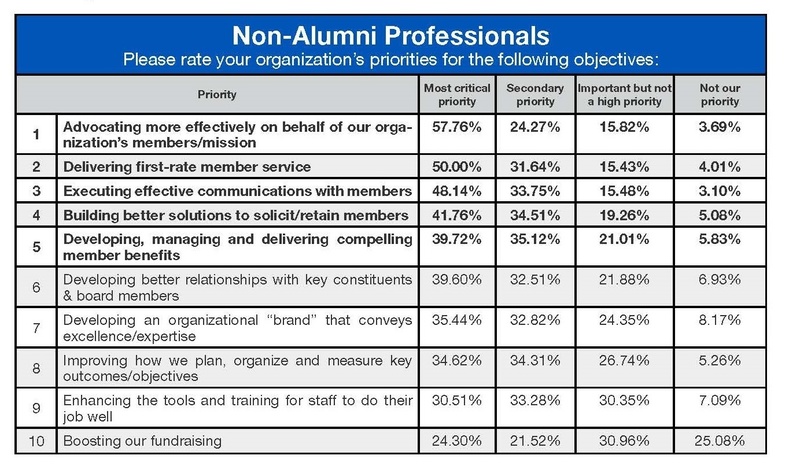 But results from this new nationwide study found some very interesting differences with how Alumni/Advancement professionals approach these tasks, as opposed to all other member-based organizations. To illustrate these differences, let’s briefly show some relevant data points from the study. First, how do alumni professionals rate themselves for how well they understand the needs of their alumni? I won’t go into the details, but it shows a 52% gap among leaders from non-alumni organizations and how alumni leaders rate their understanding of their members. It's the biggest gap among all types of organizations. Second, we asked how alumni professional assess the value of the benefits they offer, and compared the answer with non-alumni professionals. We found a 56% gap between alumni and non-alumni professionals. In every category, alumni professionals rate their benefits as having lesser quality than other organizations. I list these two findings for a little background into the differences in how most organizations use benefits to attract and engage their members, but the data further reveals some additional differences that are worth noting. For trade associations, unions and other non-alumni professionals, their value proposition is their highest priority. Their most critical priorities relate to advocacy on behalf of their members, and delivering first-rate member services. The study suggests their highest priority is on board relations and fundraising. Not much related to improving the organization’s overall value proposition. In fact, planning events and building their “organizational brand” has a higher priority than enhancing their benefits. This next graph will help shed further light on the reasons why alumni organizations are falling behind other types of member organizations. But first, I need to briefly offer some clarifying definitions. All professional’s rate career services as their most compelling benefit. No surprise there. This is consistent across the board, with the vast majority of respondents, for all types of organizations we surveyed. "Among all types of constituent-based organizations, including charitable groups, trade associations and humanitarian organizations, etc, our research suggests that no other type of organization relies more heavily on altruistic/philanthropic generosity than do higher education alumni organizations." This conclusion is not only based upon the findings of this study alone. Our VAESE Alumni Relations Benchmarking survey asked alumni professionals to consider their overall suite of benefits, and rate the influence of all their benefits on motivating alumni to join, give or engage. We saw 45% of institutions report they do not offer any benefits, but rely instead on the “philanthropic generosity” of their alumni. (See Question 26, pp44 of VAESE Alumni Relations Bechmarking study). When we consider how all other member-based organizations engage their members with benefits, they rate altruism or the “philanthropic benefit” is the lowest for its influence on attracting and engaging their constituents. When we consider how all other member-based organizations engage their members with benefits, appealing to altruism or the “philanthropic benefit” is rated the lowest overall for their influence on attracting and engaging their constituents. Alumni receive value from other types of organizations they associate with, whether it’s a frequent flyer club, their Amazon membership, or a points-based credit card. Alumni also want a give-and-take relationship with their alma mater, but they're not getting it. Our research suggests that institutions should stop ignoring their value proposition and start offering more compelling benefits. Relying on your alumni’s sense of philanthropy and altruism may get a gift in the door, but it will not improve alumni engagement. Over time, it's likely to weaken it. When looking at all types of successful organizations, those who focus on offering valuable benefits have the greatest levels of engagement. This is further confirmed by looking at the alumni associations of the Power 5 conferences schools. Fully 95% of these institutions offer a suite of meaningful benefits. Philanthropy will always have a place in higher education alumni relations... but let’s get over this notion that abusing your alumni’s sense of altruism is free of long-term consequences. All meaningful relationships are about give and take, and today's alumni are looking for a reciprocal relationship.